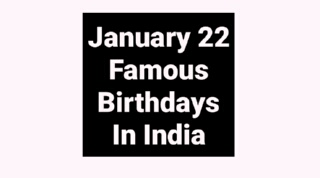 In this post -- Famous Birthdays January 22 Bollywood Actor Actress Cricket Politics, check who are sharing your birthday in India 22 January's famous birthday personality in India like Bollywood actor, actress, cricketer, politician and all famous Indian celebrity. January 22 famous birthdays in India. Namrata Shirodkar (born 22 January 1972 in Mumbai, India) is an Indian actress and model. Namrata Shirodkar was born in a moderate Maharashtrian Maratha family. She used to live in Khar, a suburb in Mumbai. Her sister is the actress Shilpa Shirodkar. She is the granddaughter of famous Marathi actress Meenakshi Shirodkar, who starred in Brahmachari. Vijay Anand (22 January 1925 – 23 February 2004), also known as Goldie Anand, was an Indian filmmaker, producer, screen writer, editor, and actor, who is known for acclaimed films like Guide (1965) and Johny Mera Naam (1970). He made most of his films for the in-house banner Navketan Films and is part of the Anand family. Vijay Anand was born in Gurdaspur. Pamela Salem (born 22 January 1950) is a British film and television actress. She was born in Bombay, India, and educated at Heidelberg University in Germany and later at the Central School of Speech and Drama in London, England. She is best-remembered on television for her co-starring role in the early 1980s ITV children's fantasy series Into the Labyrinth as the evil witch Belor. T.M. Krishna (Thodur Madabusi Krishna, born 1976) is a Carnatic music vocalist. Hailing from a family of music connoisseurs, he was exposed to the south Indian classical music at an early age. His first concert was at the Spirit of Youth series organized by the Music Academy, Chennai (India). Since then, he has travelled widely in India and abroad and won applause from his listeners. Frederick John Dealtry Lugard,(22 January 1858 – 11 April 1945), known as Sir Frederick Lugard between 1901 and 1928, was a British soldier, mercenary, explorer of Africa and colonial administrator, who was Governor of Hong Kong (1907–1912) and Governor-General of Nigeria (1914–1919). Lugard was born in Madras (now Chennai) in India. Mubashir Hassan (January 22, 1922) PhD, is a Pakistani civil engineer and science administrator known for his work in Hydraulics and his political role in the development of the atomic bomb project. In 1967, Hassan co-founded the Pakistan Peoples Party— a democratic socialist political force— with Zulfikar Ali Bhutto and J.A. Rahim. Dilipkumar Roy (22 January 1897 – 6 January 1980) was a Bengali Indian musician, musicologist, novelist, poet and essayist. In 1965, the Sangeet Natak Akademi, India's National Academy for Music, Dance and Drama, awarded him its highest honour for lifetime achievement, the Sangeet Natak Akademi Fellowship. Son of Dwijendralal Ray (1863–1913), the Bengali poet, playwright, and composer. Satyen Bose (22 January 1916—9 June 1993) was a film director from India. He has directed both Bengali and Hindi language films. Among his most notable films are Raat Aur Din, Chalti Ka Naam Gaadi, Dosti and Jagriti. Jagriti won the Filmfare Best Movie Award in 1956 and Dosti won the same award in 1964. Without any formal training in cinema Bose rose to fame with his offbeat debut film Parivartan. Thakur Roshan Singh (Birth: 22 January 1892 at Navada village of Shahjahanpur district in Uttar Pradesh, Executed: 19 December 1927 at Allahabad (Malaka/Naini jail), Uttar Pradesh) was an Indian revolutionary who was previously sentenced in the Bareilly Goli Kand (en. shooting case) during Non Cooperation Movement of 1921-22. After release from Bareilly central jail. Birbal Jha' (born October 22, 1972), is an Indian author, academician and entrepreneur. His well-known work and social venture is British lingua that provides easy and unfettered access to the study of English for all sections of society; and restore the social equilibrium in terms of curbing disparity in English education in Indian society. Shri Harilal Upadhyay was a Gujarati author, considered as one of the all-time great authors in the Gujarati language. He wrote more than a hundred books, including historical novels, social novels, short story collections, biographies, the great Mahabharat series, children's literature, poems and Plays. Harcharan Singh Brar (January 22, 1922- September 6, 2009) was the Chief Minister of Indian Punjab from August 31, 1995 to November 21, 1996. He succeeded the assassinated Chief Minister Beant Singh. He was previously the governor of Orissa from February 1977 to September 1977, and then was Governor of Haryana from 1977 to 1979. He died in Chandigarh on September 6, 2009 after a long illness. Mohan Raghavan (22 January 1964 – 25 October 2011) was a Malayalam film director. He studied at the School of Drama, Thrissur, and in Theatre Arts at Madurai Kamaraj University. Mohan made his mark in the local television industry as an award-winning script writer for serials. Hailing from Annamanada, Thrissur district, the cultural capital of Kerala. Nirmal Kumar Bose (22 January 1901 – 15 October 1972) was a leading Indian anthropologist, who played a formative role in "building an Indian Tradition in Anthropology". A humanist scholar with a broad range of interests, he was also a leading sociologist, urbanist, Gandhian, and educationist. Also active in the Indian freedom struggle with Mahatma Gandhi. Jegath Gaspar Raj is a Chennai based Catholic priest. He is the founder of the Tamil Maiyam organisation and co creator of the Chennai Sangamam festival. During 1995–2001 he served as the director of the Tamil service for Radio Veritas. He is also the organiser of the Idea-GiveLife Chennai International Marathon. He is also the founder of the Naller publications, a book publishing company. Archie Kirkman Loyd KC (22 January 1847-1 December 1922) was a British barrister and twice Member of Parliament for Abingdon. Loyd was born on 22 January 1847 in Agra in the North-Western Provinces of India, the third son of Thomas Kirkman Loyd and Annie Hirst Loyd (née Haig). He was educated at Brighton College then as a pupil of Walter Wren. Tarun Ram Phookan, polpularly known as Deshbhakta (Dexbhakta), was born in Guwahati in Kamrup District of Assam on January 22, 1877. He was educated in Cotton Collegiate School, Guwahati and Presidency College, Calcutta. Later, he was called to the Bar from Inner Temple in London. He distinguished himself as a lawyer and also served as Lecturer in Earle Law College in Guwahati. Chandrapratap Singh (born 22 January 1957) is an Indian politician from the Bharatiya Janata Party (BJP) political party. He was a member of the 14th Lok Sabha of India, representing the Sidhi constituency of Madhya Pradesh . In the sting Operation Duryodhana by the Noida based media firm Cobrapost, aired December 12, 2005 on the Indian Hindi news TV Channel Aaj Tak. Alfred Edward Quantrill (22 January 1897 - 19 April 1968) was an English footballer. Born in RawalPindi, Punjab, India where his father was based on military service, he played on either wing and appeared four times for the England national team. Quantrill played non-league football for Boston Swifts until being signed by Derby County in 1914.